Cross-cutting focus at NIH and the Food and Drug Administration. As the problems of overweight and obesity have grown, the need for new action and research has become more evident. In response, NIH assembled a Task Force to identify areas for new research across its many institutes. In March 2004, NIH released the draft of its Strategic Plan for NIH Obesity Research (www.obesityresearch.nih.gov). This report identifies key areas of research need, priorities among those areas, a road map for advancing these research priorities, and the establishment of a committee for monitoring progress in addressing the issues and problems relating to overweight and obesity. Similarly, the Food and Drug Administration (FDA) established an Obesity Working Group to advise the agency on innovative ways to deal with the increase in obesity and to identify ways to help consumers lead healthier lives through better nutrition. In March 2004, the working group released its report with a focus on the message, "calories count." The group’s long- and short-term proposals are based on the scientific fact that weight control is mainly a function of the balance between calories consumed and calories expended. That is, calories in must equal calories out. The report includes recommendations to strengthen food labeling, to educate consumers about maintaining a healthy diet and weight and to encourage restaurants to provide calorie and nutrition information. It also recommends increasing enforcement efforts to ensure food labels accurately portray serving size, revising and reissuing guidance on developing obesity drugs and strengthening coordinated scientific research to reduce obesity and to develop foods that are healthier and low in calories. HHS is collaborating with the U.S. Department of Agriculture to review the Dietary Guidelines that were published in 2000 and to draft new 2005 Dietary Guidelines for Americans. In light of the growing number of overweight and obese Americans, a major focus of the new guidelines will be providing guidance to the public on maintaining a healthy weight, and creating lifestyles that balance the number of calories eaten with the number of calories expended. These guidelines must (1) contain nutritional and dietary information and guidelines for the general public, (2) be based in the preponderance of scientific and medical knowledge current at the time of publication, and (3) be promoted by each Federal agency in carrying out and Federal food, nutrition, or health program. 5 a Day for Better Health. One of the most recognizable efforts to promote good nutrition and healthy eating habits has been the 5 A Day for Better Health Program. This national nutrition program seeks to increase to 5 or more the number of daily servings Americans eat of fruits and vegetables. In addition to its widely known slogan, the 5 A Day program reaches many individuals through health care provider networks, the internet, and print media to provide information about the health benefits of eating more fruits and vegetables, as well as easy steps for adding more of them into daily eating patterns. The Administration on Aging’s (AoA) National Policy and Resource Center on Nutrition, Physical Activity and Aging was created for the purpose of increasing and improving food and nutrition services to older Americans through their caregivers at home, with community-based service providers, and in long-term care systems. The Center focuses on linking proper nutrition and physical activity as key themes in the healthy aging process. One strategy for making this link has been the development and publication of, You Can! Steps to Healthier Aging, a community guide detailing a 12-week program to help older Americans “eat better” and “move more.” The Center is awarding 10 mini-grants to local communities to implement the You Can! Program in 2004. AoA provides funding to states to implement health promotion and disease prevention activities. Educational information is disseminated through Senior Centers, congregate meal sites and home-delivered meal programs. Health screening and risk assessment activities including hypertension, glaucoma, hearing, nutrition screening, cholesterol, vision, diabetes, bone density and others are also provided. Physical activity and fitness programs are provided along with education about the prevention and reduction of alcohol, substance abuse, and smoking. Further, the importance of appropriately managing medications is emphasized. VERB. It’s what you do. Since the problem of overweight and obesity has also reached America’s young people, the youth media campaign, VERB. It’s what you do. was created. VERB’s goal is to promote social norms that support physical activity and portray fitness as fun and healthy. In order to reach tweens and motivate their participation, HHS/CDC has enlisted partner organizations in the campaign, such as 4-H, Boys and Girls Clubs and the National Hockey League (NHL), to brand the VERB message and make it appealing to its audience. VERB also reaches out to parents and other adults influential to young people, encouraging them to support and participate in physical activity with tweens. The President’s Council on Physical Fitness and Sports (PCPFS). Although it is an independent agency, the PCPFS is headquartered at HHS. It promotes physical activity for all ages, backgrounds and abilities with information and publications (www.fitness.gov) and physical activity/fitness motivational awards programs (www.presidentschallenge.org). The Diabetes Prevention Program demonstrated that prevention of type 2 diabetes is possible in high-risk adults, including adults from minority populations who are at disproportionately increased risk  . The Diabetes Prevention Program demonstrated that diet and exercise that achieved a 5-7 percent weight loss reduced diabetes incidence by 58 percent in participants randomized to the study's lifestyle intervention group. Participants in this group exercised at moderate intensity. The lifestyle intervention was effective in both men and women and in all of the racial/ethnic groups. Lifestyle intervention worked particularly well in people over age 60, reducing the development of diabetes by 71 percent in this group. Volunteers randomly assigned to treatment with metformin had a 31 percent lower incidence of type 2 diabetes over the 2.9 year average duration of participation in the trial. Metformin was most effective in younger and heavier study participants. About twice as many people in the lifestyle group compared to placebo regained normal glucose tolerance, showing that diet and exercise can reverse IGT. Following the dramatic and positive results of the Diabetes Prevention Program, in 2002 the American Diabetes Association and the National Institute of Diabetes and Digestive and Kidney Diseases (NIDDK) published a position paper on “The Prevention or Delay of Type 2 Diabetes”  . In addition, a subsequent National Institutes of Health (NIH) and CDC co-sponsored study showed that the lifestyle and metformin interventions were cost-effective and could be implemented in routine clinical practice  . Ongoing follow-up studies of the Diabetes Prevention Program patient population are currently examining the durability of the interventions in preventing or delaying diabetes onset as well as their effects on cardiovascular disease and other diabetes complications. The successful and well-recognized National Diabetes Education Program, a partnership of the NIDDK, the CDC, and more than 200 public and private organizations, was established to disseminate information about the importance of glucose control in those individuals with diabetes following a successful NIDDK-supported trial. Following announcement of the Diabetes Prevention Program results, this well-established program was expanded to launch the primary prevention campaign, Small Steps, Big Rewards, Prevent Type 2 Diabetes, in November 2002. 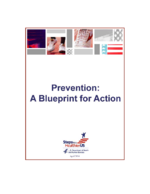 The Small Steps educational material contains a “Game Plan” for health care providers and patients that gives information about implementing a program to prevent or delay disease onset. The Game Plan also includes a “fat and calorie counter” as well as a “food and activity tracker” so individuals can more easily monitor food intake and physical activity level. The Small Steps, Big Rewards, Prevent Type 2 Diabetes campaign has reached millions of people. A pilot with five HRSA-funded health centers was initiated in November 2002 to translate the results of the Diabetes Prevention Program into practice, utilizing the Health Disparity Collaborative strategy and models. The Health Resources and Services Administration (HRSA), CDC, NIDDK/NIH, and the MedStar Research Institute support the Diabetes Prevention Prototype Collaborative. Health Disparity Collaboratives represent a multi-pronged approach to improve quality that includes a care model, a system improvement model, and a model of learning and sharing that allows for systematic spread of quality improvements. Health Centers participate in year-long intense learning and quality improvement activities that involve attending learning sessions and a final meeting to disseminate outcomes. Health Centers report the results of nationally shared measures while disseminating successful changes throughout their system of care through uniform, nationally recognized process and outcome measures. As part of the Diabetes Prevention Collaborative pilot, teams have tested and implemented successful strategies to identify persons at-risk for diabetes, and screen them. As of November 2003, 3,167 high-risk persons have been identified; 903 (28.5 percent) have been screened, resulting in 276 (30.6 percent) prediabetes patients in the registry and 155 (17.2 percent) newly diagnosed persons with diabetes. Thirty-four patients (16.6 percent) have met the goal of 7 percent or greater average weight loss. Efforts in American Indian Populations. American Indians and Alaska Natives (AI/AN) have the highest prevalence rate of diabetes in the U.S. Diabetes mortality in AI/AN is increasing, as are the rates of diabetes in children and youth. In 1979, Congress established the Indian Health Service (IHS) National Diabetes Program to address the epidemic of diabetes in American Indians/Alaska Natives (AI/AN). The mission of the National Diabetes Program is to develop, document, and sustain a public health effort to prevent and control diabetes in AI/AN people. The agency promotes collaborative strategies for the prevention of diabetes and its complications in the 12 IHS Administrative Service Areas (regions) through coordination of a network of 19 Model Diabetes Programs and 12 Area Diabetes Consultants. The Special Diabetes Program for Indians grant program, first established in1997 and now extended through 2008, distributes over 96 percent of its funds through grants awarded to 318 programs under 286 administrative organizations within the 12 IHS Areas in 35 states. Nationally, 67 percent of the new grant programs are focused on primary and secondary diabetes prevention. Section 721 of the Medicare Prescription Drug, Improvement, and Modernization Act (MMA) of 2003 establishes the Chronic Care Improvement Program, a population-based approach to helping people with chronic diseases, such as diabetes, manage their illness. CMS also has several disease management demonstrations to help people with diabetes and other chronic conditions better manage their disease and prevent complications. A demonstration established by the Medicare, Medicaid, and SCHIP Benefits Improvement and Protection Act of 2000 provides disease management services and a comprehensive prescription drug benefit to 30,000 beneficiaries living in California, Arizona, and parts of Louisiana and Texas. The Coordinated Care Demonstration established by the Balanced Budget Act of 1997, currently operating in 15 sites, is testing whether case management and disease management approaches are clinically effective and cost-effective. A recent accomplishment is the Public Health Service document, Treating Tobacco Use and Dependence: Clinical Practice Guideline, which identifies treatments with demonstrated effectiveness in helping smokers quit. This resource will be a tremendous aid to Americans trying to quit tobacco use. It is available online at: http://www.surgeongeneral.gov/tobacco. The FDA approves drugs intended for smoking cessation and has approved over-the-counter use for several of them. These steps have been instrumental in helping people quit smoking. Cessation materials across the Department also have been tailored to more effectively reach specific populations and decrease tobacco-related health disparities. Examples include the National Cancer Institute’s (NCI) La guía para dejar de fumar, a smoking cessation guide written in Spanish, and CDC’s Pathways to Freedom, a smoking cessation guide tailored to the African American community. This CDC guide provides education and guidance for individuals who smoke, helps friends and families be part of the solution, and provides strategies for community members who want to educate people about the dangers of tobacco. The Centers for Medicare and Medicaid Services’ (CMS) Medicare Stop Smoking Program is a demonstration project on the most effective and cost-effective ways to help Medicare beneficiaries quit smoking. Findings from this project may affect a substantial proportion of the country, and have implications for health plans and other populations. Programs from across the Department collectively create a comprehensive approach to promoting smoking cessation among women, particularly pregnant women. While women who smoke during pregnancy comprise a small percentage of the overall population, cessation efforts for these women are critical to protect the health and well being of future generations, including opportunities to continue smoking cessation following pregnancy and childbirth. Examples include the National Partnership to Help Pregnant Smokers Quit, a coalition of more than 50 federal, national, state, and local organizations that has developed guiding strategies around issues critical for pregnant women; several National Institute of Nursing Research-funded research projects; and CDC’s Dispelling the Myths About Tobacco: A Community Toolkit for Reducing Tobacco Use Among Women (www.cdc.gov/tobacco/sgr/sgr_forwomen/sgrtool.htm). These studies and programs seek to identify effective cessation and relapse prevention techniques, and to provide timely and relevant tools for community programs, including mass media and print materials. These efforts are critical to ensure that women who quit smoking during pregnancy continue to not smoke. Examples of successful collaboration among U.S. public health agencies and organizations include: the development of the National Blueprint for Disseminating and Implementing Evidence-based Clinical and Community Strategies to Promote Tobacco use Cessation, a practical guideline for implementation of cessation strategies with demonstrated effectiveness; and the National Blueprint for Action, developed by the Youth Tobacco Cessation Collaborative to guide future research on cessation strategies for youth. NCI has a toll-free “Smoking Quitline” that will connect individuals with information specialists to answer smoking-related questions in English or Spanish. The Synar program is one example of an effective collaboration between HHS and State governments to effectively prohibit the sale of tobacco products to minors. As a result, the rate at which retailers are willing to sell tobacco products to minors has decreased from a high of 41 percent in 1996 to approximately 14.5 percent in the most recent surveys in 2003. HHS and its partner organizations also have helped state tobacco control programs through the creation of Smokefree.gov, the Web-based cessation tool provided by NCI with support from CDC and others, as well as by providing access to low-cost mass media materials and delivering relevant technical assistance and training through CDC’s Media Campaign Resource Center. HHS agencies will continue monitoring youth tobacco-related behaviors through such programs as the following. The successful, ongoing surveillance of this ever-changing population through established tools, such as the National Institute on Drug Abuse (NIDA) Monitoring the Future Study, CDC’s Youth Risk Behavior Survey, and the Substance Abuse and Mental Health Services Administration’s (SAMHSA) National Survey on Drug Use and Health, has been vital to determine trends and focus efforts at the federal, state, and local levels. The Synar Regulation, which is implemented and monitored by SAMHSA's Center for Substance Abuse Prevention, and requires States, the District of Columbia and Territories to enact and enforce tobacco access laws that restrict the availability of tobacco products to youth under 18 years of age, has been demonstrated to be effective in reducing illegal sales to minors. The simple facts about tobacco use – that it causes death and disease and results in a tremendous social and economic burden – are well documented. There is still a great deal to be known. NIH is conducting research aimed at better understanding the biological, genetic, and behavioral aspects of nicotine addiction, which will aid in the development of more effective pharmacological and behavioral treatments. As new tobacco products and cessation aids become available, many questions arise regarding their efficacy and health effects. Data collection on youth and adult knowledge, attitudes, and behaviors is conducted through a multi-factorial surveillance system for both adults and youth by CDC, NIH, and SAMHSA. This surveillance remains critical to understanding the impact of tobacco use over time, and to monitor trends in tobacco use among specific populations. The Department supports an extensive training network to provide technical assistance and expertise to State and local tobacco control program staff to implement the findings of Department-wide research. Examples include the National Conference on Tobacco or Health, CDC’s Annual Leadership Forum, Community Guide Workshops, and Disparities Pilot Training Programs. Through coordinated efforts across the agencies, communication campaigns disseminate key information to the public regarding effective cessation treatments, the hazards of exposure to secondhand smoke, and other prevention messages. First-ever national assessment of health literacy as part of the 2003 National Assessment of Adult Literacy (NAAL), in partnership with the U.S. Department of Education. Data will be available in 2005. The Institute of Medicine report, Health Literacy: A Prescription to End Confusion, sponsored in part by the National Cancer Institute, was released in April 2004. Guidelines and tools to improve communication with the public. HORIZONS Project – a communication toolkit that provides information on demographic research, tip sheets and sample prototype communication products for working with minority populations from CMS. Agency and nationwide health communication, health literacy and risk communication training through the health communication certificate program and CDCynergy CDRom modules from CDC. Training of healthcare providers in plain language, clear and effective communication, and health literacy through Area Health Education Centers, funded by HRSA. NIH Plain Language Initiative and Award program – NIH requires the use of plain language in all new documents for the public, government entities and staff, and provides annual awards to staff for the effective use of plain language.